Kate Thick says there are tons of felled wood lying about rural Northumberland that could be used for a potential log bank. From the outside, Rose and John’s cottage in rural Northumberland looks the rural idyll – but step inside and you soon see the reality is far harsher. My van had a pile of logs in the back and Elizabeth, a member of a Christian community who introduced me to Rose and John, helped me stack them in the shed. The cottage has a wood burner in the living room, which also heats the water. The living room is the only warm room downstairs, the kitchen is freezing. The walls are damp, there is no double glazing. They have rented the cottage for 20 years but are keen to move to Wooler or Alnwick as life is too hard and they need to be nearer shops, transport and hospitals as John is now unable to drive. Due to very poor health, John cannot work. John collected wood – old furniture from skips or charity shops – and cut it up, but he is now barely able to lift the logs. Rose tried her best but hurt her back. Coal is easier to handle, but they cannot always afford it. Rose and John are very careful to never get into debt, they never take out loans. Despite their problems, Rose had made the most delicious scones as a thank-you for the logs. It is too much for them now to grow vegetables, to be as independent and resourceful. Friends like Elizabeth have been a lifeline for them. Their situation isn’t unique. The idea for setting up a log bank, like a food bank but not open to the public and a delivery service only, struck some time ago. There are tons of felled wood lying about rural Northumberland so why not give it to those in need – people who due to financial constraints, poor health, age or isolation have difficulty obtaining or handling logs? Felled wood is an important habitat for small mammals, birds and insects, but there is a lot of it to spare as fuel. Properly seasoned hard wood burns hot and is clean; although not CO2 free, burned efficiently, it produces virtually no smoke. There is growing evidence that logging is damaging forests and the soil, reducing their ability to store carbon, but it is not a fossil fuel and it is renewable. It is sad and baffling that more than one in 10 households in England are living in fuel poverty; a Government report revealed that in 2016, more than 2.5million families were unable to pay the costs associated with heating their homes without falling below the poverty line. The percentage of households in fuel poverty across Northumberland is above the national mean. A household is said to be fuel poor if it needs to spend more than 10 per cent of its income on fuel to maintain an adequate standard of warmth. Fuel poverty is a particular challenge here because of the geography of Northumberland. Tim Miller-Fay, energy policy officer at Northumberland County Council, said: “The council successfully attracted Warm Homes funding to provide both first time gas central heating and air source heat pumps to eligible tenants. “A further bid has been submitted for the coming financial year to enable this work to continue. “In the council’s work to tackle fuel poor households, they estimate up to 12 per cent of Northumberland’s homes could be in fuel poverty, around 18,000 homes. Warmth is essential for well-being and health. A lot or rural homes are not on gas, so even if only 10 per cent of those 18,000 homes burn wood, that would be 1,800 homes. 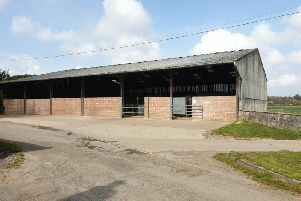 A few log banks could be set-up on farms or estates, requiring a space about three or four times that of an average car garage. From these locations, logs could be processed and stored and then delivered by DBS verified volunteers, who could also stack the logs and do basic safety and efficiency checks. To get the project going, a well-equipped pilot log bank could be set up within the benefit area of the Ray Wind Funds. This area covers Bavington, Birtley, Elsdon, Corsenside, Kirkwhelpington, Otterburn, Rothley and Wallington. It is hoped that the log bank can be established over the summer so seasoned logs are ready for next winter. First, we need to know the number and location of households in fuel poverty, and if landowners and businesses such as sawmills will donate wood. Volunteers are also important for the collection, processing and delivery of the wood. Hopefully, apprenticeships and at least two jobs can be created. The advice, support and collaboration with agencies such as Northumberland County Council and Community Action Northumberland, and those who know about handling wood, are essential. To assess the feasibility of the project, an online survey has been released and all relevant organisations will be approached. Churches, libraries, post offices, village halls, doctors’ surgeries, the WI and even local shops as far as possible will be made aware of the project. Confidentiality is assured given the sensitive nature of some of the data we are seeking.